Good morning! This week is a busy one, so much going on this time of year, right? Yesterday I went over to the studio to pick up the Sunrise Studio yardage to make a couple of projects for market. My picture doesn't do it justice, it's so bright and cheerful. I love the projects, and I will take some photos along the way so you can see what I'm making. As with any project, preparation is the key, so I'm getting everything all pressed up nice. My own early sample yardage should arrive at the end of the week, and I'm excited about that. I can't wait to see it all again! Leaving tomorrow and headed your way. You'll find us on a soccer field in Livermore, cheering 6 yr olds and then racing to Berkely for a kids play. And that's just Saturday...lol. In a few months I will be spending more time each trip so keep the coffee warm. 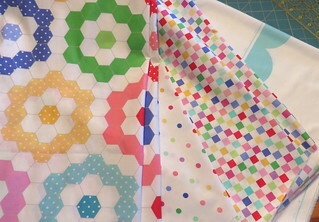 Love these happy colors and am looking forward to seeing your projects! I saw what Holly posted on Instagram and they colors are bright and cheery.